Conventional theatre spaces too run-of-the-mill? How about a boxing gym, a beach, bed or bus? If conventional theatre spaces are just too easy for you, how about a boxing gym, a beach, bed or bus? A site-specific play staged in a boxing gym, based on interviews with Muslim female boxers, 'No Guts, No Heart, No Glory' is devised in collaboration with four 16-19 year old Muslim female performers and explores being young, fearless and doing the unexpected. With a live electronic sound score, epic visual design, cinematic lighting and the energy of a club. Staged in Craigmillar, approx 20 minutes from Edinburgh City Centre by bus (Routes 12 and 30). Live art clashes with music and rubs up against theatre in probably the earliest show at the Fringe. Stories of endeavour are interwoven with haunting music, lifeguard drills, calls for help and struggles for breath featuring a score by Jocelyn Pook and performances from chart-topping soprano Laura Wright. 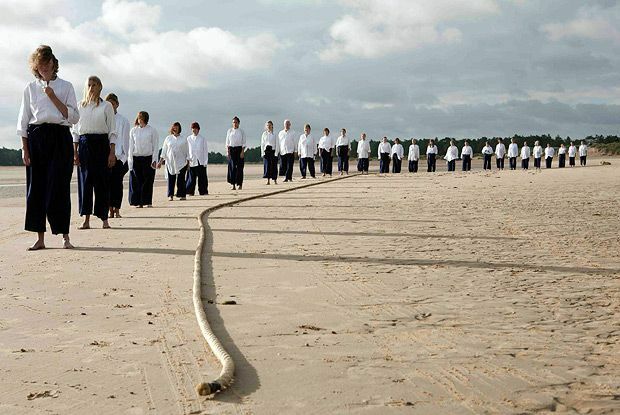 Summerhall @ Portobello Beach, 0131 226 0000, 8–10 Aug, 6.30am, 8.30pm, £10 (£8). Directed by Kim Noble (he of deconstructionist art / comedy double act Noble and Silver) and set in a bedroom, a man dubbed the ‘Vacuum Cleaner’ recalls his years of struggle against the state, the Mental Health Act and multinational corporations. For each show, 12 people are invited to join him under an oversized duvet. Pleasance Courtyard, Pleasance, 0131 556 6550, 7–24 Aug (not 11–13, 18–20), 6.30pm, £10 (£8). If you thought catching the late bus home can sometimes be a crazy experience, why not hitch a ride with Java Dance as they take you on a truly magical and potentially mysterious tour through the city. Assembly George Square Gardens, George Square, 0131 623 3030, 4–21 Aug (not 11, 16), 4.30pm, 6.15pm, £10.50–£11.50 (£9.50–£10.50); 8, 15 Aug, 8pm, £11.50 (£10.50). Fourth Monkey deliver an innovative late-night promenade take on Lewis Carroll’s iconic masterpiece. Not sure where the Mad Hatter’s going to get a cup of tea at that time of day, though. TheSpace, North Bridge, 0131 510 2386, 8–23 Aug (not 10–12, 17–19), 11.55pm, £14 (£12). Previews 6 & 7 Aug, £10 (£8). If you go down to the pub today you’re in for a big surprise as Not Too Tame (motto: ‘theatre for all’) transform one of the Old Town’s most iconic watering holes (famed for being frequented by George Best and journalists aplenty) into an immersive theatre space. The Jinglin’ Geordie, Fleshmarket Close, 0131 226 0000, 2–25 Aug (not 11, 19), noon, £7.50–£10 (£6.50–£9). Previews 30 Jul–1 Aug, £6. Immersive theatre from Not Too Tame. Java Dance Company Come ride the Red Bus through the streets of Edinburgh as dancers propel themselves along the aisles and hang from the roof. Physical comedy, kinetic energy and outrageous scenarios combine to create a magical mystery tour. Fresh from sell-out seasons at 12 New Zealand and Australian arts festivals.